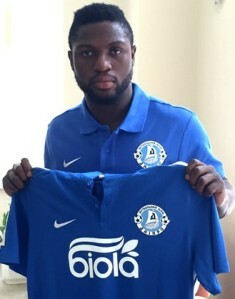 Twenty four hours after the transfer of Michael Babatunde was confirmed by Dnipro Dnipropetrovsk, he made his official debut for the 2015 Europa League finalists. The attacking midfielder came off the bench in the 64th minute, and helped his new employer record a 2 - 0 win over one of the favorites for the Ukrainian Premier League title, Shakhtar Donetsk . Even before the transfer was done and dusted, the Nigeria international started training with his new teammates few days ago. Michael Babatunde severed ties with Volyn this summer and stayed away from pre - season training after they failed to fulfill contractual obligations, with the Lutsk - based side owing him more than six months wages. Today’s game in Odessa was the 22 - year - old’s 81st appearance in the Ukrainian top flight.